If I ever need to get my kids’ attention, I pull out the blender and leave it on the kitchen countertop. Because they know in a matter of minutes, a delightful, refreshing smoothie will be coming from this whizzing, whirling machine. Also, my son likes anything that makes noise. Tell me I’m not alone in this. I digress. Let’s get back to what we were talking about - healthy smoothie recipes for kids. Smoothies for kids can be an incredibly easy and simple way to pack in nutrition for a wholesome snack and cool treat. It’s a kid friendly way to offer your child something that is loaded with key vitamins and minerals that support their overall health and growth. These vegetable and fruit smoothies combine carbohydrates, protein, and healthy fats without added sugar to keep their bellies content and satiated. Plus these are crowd-pleasers and easy to make for everyone in the family; not to mention, clean up is easy breezy. Now that is something that both mamas and kiddos can get excited about! Why Healthy Smoothies for Kids? When Can I Offer These Kid Friendly Smoothies? The best part of smoothies is that you can really have them anytime and anywhere you have a blender accessible to you! Blend up your ingredients and serve them with any meal, including breakfast, lunch or dinner. My favorite time to have smoothies is for a snack, especially on a hot summer day. These are great to pack-up in your favorite thermos to take on the go, too. Yum! Generally, these smoothies are free of major food allergens. With the exception of the Orange Creamsicle Smoothie, these recipes are all dairy free, but feel free to substitute with your milk of choice or whatever you might have on hand, such as coconut milk or regular milk. The beauty about these easy smoothie recipes for kids is how versatile they can be. If your child has any allergies or sensitivities to certain foods, like dairy, nuts, etc., you can easily swap out ingredients that work better. Check out these easy smoothie recipes below! The oranges in this smoothie make it high in vitamin C, which can help naturally boost your child’s immune system. Do you have overly ripe bananas that don’t get eaten during the week? Peel them and stash them in your freezer to use when you’re ready to make this healthy breakfast smoothie. Add all ingredients to your blender. Sometimes green vegetables, like kale and spinach, can be harder for kids to eat because of the strong flavors. Combining these nutritive greens in a smoothie can make it easier to expose your kids to veggies. The addition of the avocado adds yummy healthy fats that naturally make this smoothie creamy. Blend until smooth, serve and enjoy! Did you know that cocoa powder and dates are a rich source of potassium, fiber, and other key minerals that are important for your child’s development? The combination of these ingredients with the frozen fruit makes this smoothie a delightful treat! Have extra smoothie leftover? Pour your smoothie mixture into a popsicle mold for a healthy frozen treat later! Want to boost the protein in your smoothie? As an option, you can easily add a tablespoon or two of your favorite nut butter, like almond butter, to increase the protein content. You can also add in a scoop of your favorite protein powder to any of these smoothie recipes as well. Need a quick breakfast? Prep your smoothies the night before and store them in mason jars in your fridge for a ready-to-go breakfast in the morning. Send smoothies in your kid’s lunch by pouring in a thermos. Bonus: the cold thermos can double as an ice-pack in your child’s lunch box. Use smoothies as a base for a yummy smoothie bowl. Simply pour your smoothie in a bowl and add your favorite toppings, like granola, nuts, etc. Want more? Double the recipes to make extra! As you can see, the possibilities are endless! If cooking with your kids feels completely overwhelming - that’s totally okay, mama. The sheer mess and noise can sometimes feel chaotic and be enough to throw in the towel before you even get started. Most of all, have fun! Remember that food is a way to connect with our kids. 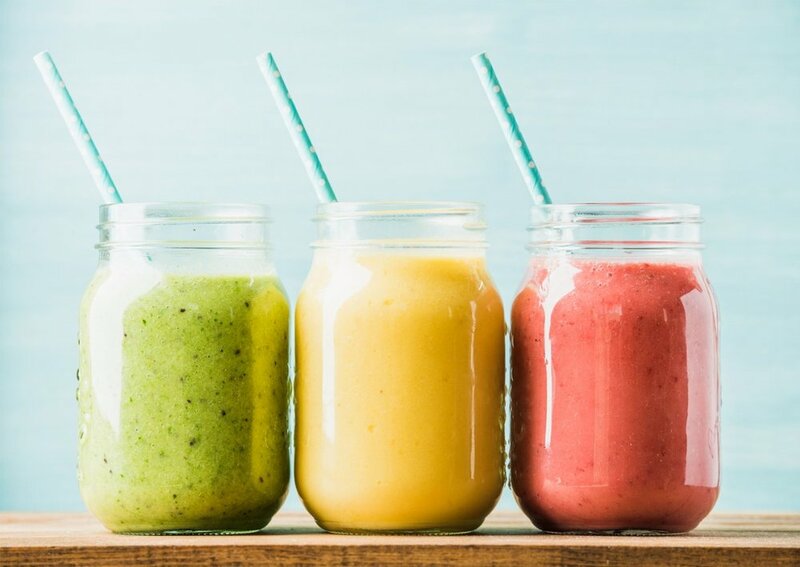 Make these yummy and easy smoothies as a simple way to reconnect and enjoy a delicious and refreshing treat. Get Your FREE Guide: "5 Healthy Habits Every Mom Wants For Her Kids, (That She Needs, Too!)" Sign up with your email address to have it sent straight to your inbox! Thank you! Your guide will be delivered shortly.